As North Melbourne are set to embark on their Tasmanian experiment this weekend with their first home match at the picturesque Bellerive Oval, my mind wandered down to the Apple Isle and it’s impact on Australian Football. The names Nash, Hudson, Balldock and Stewart are uttered with great reverence, such is their standing in our game. Though recent years have seen Hawthorn, St.Kilda and now North call Tasmania it’s second home, it is my club, Richmond, who appears to have a special connection with Tassie, especially when it comes to the glamour forward. Now this is a little strange. 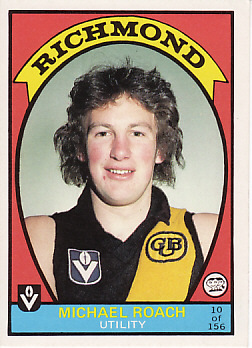 From 1967 through to the present day, there have been just three years in which Richmond’s attack has not been spearheaded by a Tasmanian. 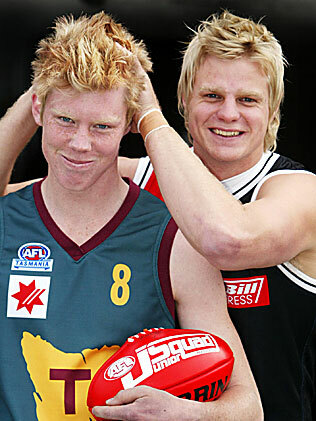 Royce, Roach, Richo, Riewoldt! The four Richmond R’s! What’s going on here? Is it the ghost of the extinct Tasmanian Tiger leading all these key forwards to Tigerland? Who can be sure? I have mentioned the symmetry of jumper number, name and position, however there is clearly one piece of the puzzle still missing. Will Richmond recruit a Tasmanian key forward in ten years time, whose name begins with ‘R’ and will he be given the number 4 guernsey? Time will tell. Now Brendan Gale (proud Tasmanian and Richmondite), there’s a task for you! A tradition worth preserving. PS. 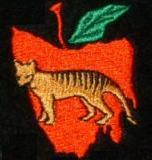 Not only have these players contributed to the Richmond cause, the three players whose careers have been completed were bestowed the honour of making the Tasmanian Team of the Cenruty. Can you spot Royce, Roach and Richo? PPS. Off the very top of my bonse…I’ve also thought of Benny Gale and Justin Plapp as other Tassie forwards to grace Richmond’s forward line. Who have I missed and who are your favourites? This post was proudly brought to you by the letter R and the numbers 4, 8 & 12!